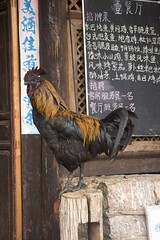 Many of the towns around and including Lijiang are world heritage listed. They’re beautiful but now crowded with full-on tourism. 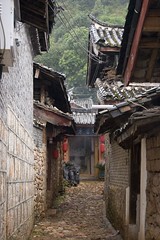 The streets are stone and often have fresh running water channels by the side. The water in Lijiang is clean enough to have loads of gold fish swimming around. 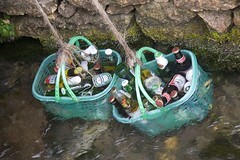 The water is used for all sorts of things, including cooling beer, but there seem to be common rules to keep it clean-ish. Many people have fires burning in their houses which are either wood or coal. I haven’t smelt coal for ages. Don’t know if you saw it but UK’s Channel 4 shot a multiple part doco called “Beyond the Clouds”. I have strong memories of that series and unlike most docos it was more like a soap opera than a doco as it followed various people doing everyday things. The doco is one of the reasons I wanted to go to China. After world heritage listing, earthquakes and being seen on the world stage Lijiang has now gone from rural town to tourist city. Don’t get me wrong, it is still very beautiful and you get hints at what it was like. We had a trip out to Shuhe, which is a bit more preserved, where many of these photos are from. They had this cool three well system where the top well is for drinking only, and the water then runs down into the second well, which is for washing vegies etc, then it flows into the third well which is for the mucky stuff. Water runs everywhere and is so well managed.